In the 1960’s, healthcare providers realized the benefit of speedier treatment and more efficient protocols when utilizing pre-stocked medicine carts in the hospital. The crash cart was born out of the need to have supplies and medication immediately available in life-threatening situations such as heart or pulmonary failure. These medical carts with drawers have been used in hospitals and clinics ever since. How Is A Crash Cart Different from Other Supply Carts? The typical supply cart in the hospital or medical office contains commonly used supplies such as flushes, IV tubing, bandages, alcohol swabs, and gauze. The cart might also be stocked with latex gloves, a thermometer, or a blood pressure machine. A crash cart does not hold the typical, everyday supplies of an equipment cart. Instead, it functions as a lifesaving station. It holds critical medications to restart the heart, intubation supplies, and defibrillators. It also holds supplies for quickly starting an IV and prepackaged kits such as surgical gowns and sterile items. These carts work as a self-contained miniature emergency department. They are portable so they can be moved quickly to the area of need. Typically, the wheels can be locked into place to secure it when in use. What Types of Crash Carts Are Available? 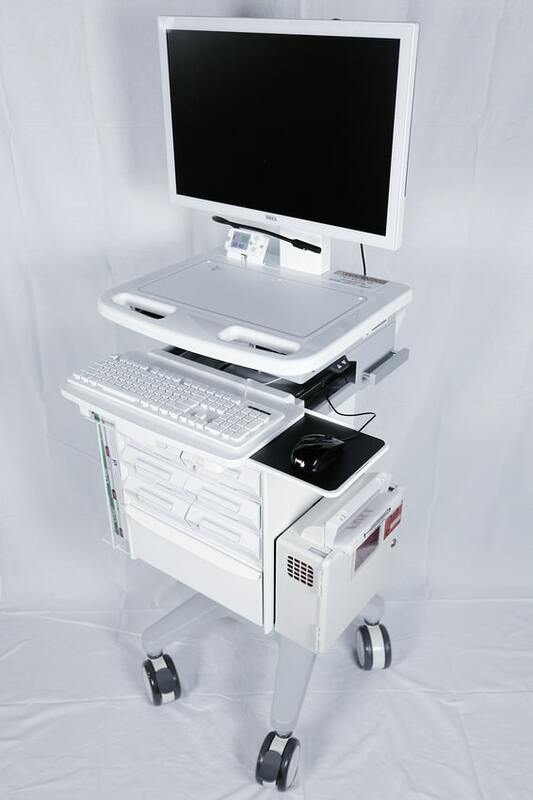 A crash cart can be customized the same way any other medical rolling cart with drawers is customized. There are many types available. A crash cart might come equipped with shelves, drawers, and bins. These areas can be color coordinated to indicate specific supplies. This helps staff move quickly when an emergency strikes. Most crash carts have a defibrillator and paddles on top. The drawers and shelves might be arranged differently between different facilities. However, most hospitals arrange their crash carts in a specific order. This aids the medical team in learning the crash cart for when they need it. The first drawer usually contains lifesaving medicines such as Dopamine, Epinephrine, Sodium Chloride, and Atropine. It will also contain alcohol swabs, saline flushes, and sterile water. Bags of fluids will be nearby, either in the first or second drawer. The intubation drawer holds any necessary equipment to perform an intubation. It will include endotracheal tubes, inflatable cuffs, tongue depressors, and the laryngoscope handle, as well as a small flashlight, blades, and other necessary supplies. Most crash carts contain a drawer for starting an IV line quickly. It will hold disinfectants, tourniquets, vacutainers, multiple needles in varying sizes, and tubing. These may be loose supplies or in prepackaged starter kits. This drawer is typically dedicated to prepackaged kits for urgent use. Suction supplies, sterile kits, lumbar puncture kits, and large needles might be found in this drawer. A surgical floor will likely have slightly different supplies on hand than an intensive care unit, as will a pediatric department. Designing a cart with your facility in mind will allow you to get the perfect size and weight for your workflow. 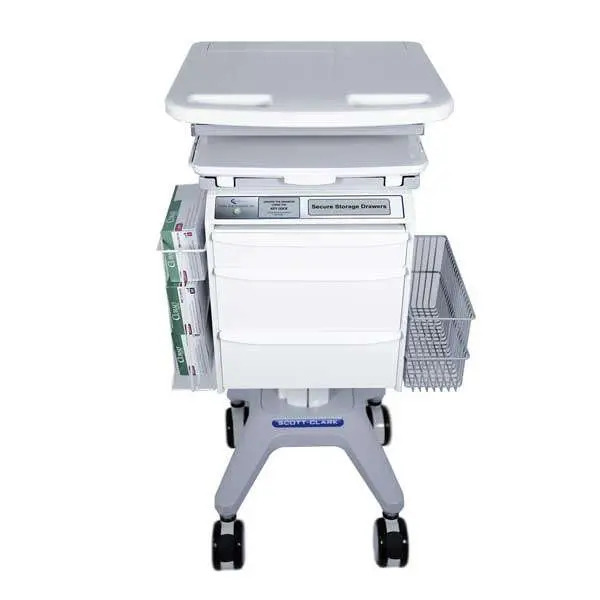 A trusted medical cart supplier such as the experts at Scott-Clark can help you customize a crash cart that will enable you to focus on patients in an emergency. Seconds matter when working in medical care. A well-stocked crash cart will save you time while you save lives.